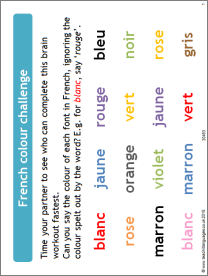 In this fun little activity, students need to say the colour in French that each word is written in (the font colour), rather than the colour spelt by each word. It's a good brain workout, especially if they race to time each other. Fastest one wins!